I recently visited the POLIN Museum for the History of Polish Jews and discovered an innovative new museum that I believe will change the ways we tell Jewish narratives and educate about the past and present. Let me begin with a confession. This was my first trip to Poland ever. The first because my late mother, who was born in Poland and escaped in 1939, never forgave the Poles for the way they treated the Jews. She refused to have anything to do with Poland and I respected her views and beliefs. I was also rather critical of the teen educational tours from Israel to Poland, although I gave my own children the freedom to go (and all four ended up going). I decided now, at age 62, that it was time for me to shift from looking backward to looking forward to the narrative we will leave to future generations. The POLIN Museum will revolutionize the conversation because it states that there is more to Jewish History in Poland than the Holocaust. It reminds us how great the loss was by highlighting the 1000 years of life and civilization building that the Jews experienced in Poland. The visitors cannot help but identify with and be impressed by the amazing and unique human historic tale that unfolds to them through the museum’s galleries. Eventually they ask themselves: what does all this mean to us today and going forward? This process is mirrored in the physical nature of the museum itself – when you enter the Museum’s lobby the top of the roof of the wooden synagogue from Gwoździec, which is presented in the lower level, “breaks” through the floor as if to say that the past is involved in the conversation of the present. POLIN is a breakthrough experiment in bringing the past into today’s conversation. 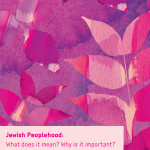 It frames new questions that will yield new answers regarding the Jewish collective enterprise. It engages but at the same time challenges. Despite the different historical context I found it extremely relevant to today’s discussion of the role and mission of Jewish communities among the nations where they reside. This brings me to the last point that also has a personal twist. During my years in California, in the Bay Area, I was exposed to the relentless efforts of Tad Taube who was key to making this Museum happen. Tad understood that Peoplehood is all about civilization-building, and he also understood that the exchanges and dialectics between Jews and individual civilizations enriches them and contributes to the overall human civilization. In that spirit the Museum also contributes to the Polish conversation and to the formulation of its future collective ethos. The Polin museum shows us how individual Jews can directly impact our civilizational effort. It is another way of stating that the Jewish future is in the hands of the Jews today. We need to build it through conversation with our forefathers and mothers and in recognition of their unique contribution to Jewish and world civilizations. Visiting the POLIN Museum is a must for any Jewish educator today. See here for more information about the museum. And for those not planning to visit Poland, the museum also hosts several online resources, including The Virtual Shtetl, a Central Judaica Database and the Polish Righteous – a repository of stories of rescue.